"True silence is a key to the immense and flaming heart of God." In 1990 I went with Linda, Dan, and Josh to Singapore to teach at Assemblies of God Bible College. I taught two courses over a 20-day period. One of them was my Spiritual Formation and Prayer course. On every class day I sent my Chinese students out to pray for an hour. I told them to find a quiet place outside of our building to pray. 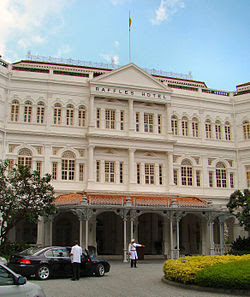 The college was located in the heart of Singapore, near the historic Raffles Hotel. When you stepped outside the building you entered the crowded streets of busy Singapore. I decided to pray in the lobby of the Raffles Hotel. This was where many great writers once stayed, including Ernest Hemingway and Somerset Maugham. The lobby was beautiful, and a beehive of activity. In the center of all buzzing this my heart was still. And silent. Years of stillness and silence had built into me a capacity to focus, to attend to one thing. A silent and still heart is a receptive heart. It is in this quiet, inner place that I most often hear the voice of God. Heart-silence is a key that opens to the immense and flaming heart of God.